Wednesday, Sep. 5, 2018, 2 – 3:30 p.m. 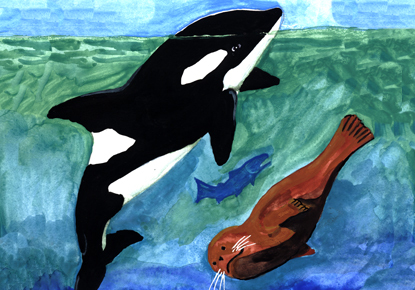 Learn how to draw/paint an orca whale with Haida artist Sondra S. Segundo. Registration is required for this program. Learn about the powerful relationship between the Haida people and the Orca and how to draw a formline orca step by step. Segundo will also read from her book, Killer Whale Eyes! For children ages 13 and up. This program is part of this year’s Summer of Learning program Splash! Adventures with Water, which encourages reading and activities around science, technology, technology, arts and math. We are offering over 250 free youth programs throughout the city this summer. You can pick up a Summer Action Guide at any Library location. Library events and programs are free and everyone is welcome. Registration is required. <a href=eventactions.com…">Online registration for this program opens two weeks before the program starts and closes three business days before the program date. Make changes to your registration after that date by calling or visiting the branch. The 2018 Summer of Learning program, Splash! Adventures with Water, is funded by generous support from The Seattle Public Library Foundation.